The image is based on the painting "George Washington Taking the Salute at Trenton", by John Faed, 1899. I chose the image for it's iconic and nationalistic portrayal of George Washington. I used the image of George Washington many times in previous works so this piece was a continued exploration of nationalism and altering past art historical images to critique the present and imagine the future. 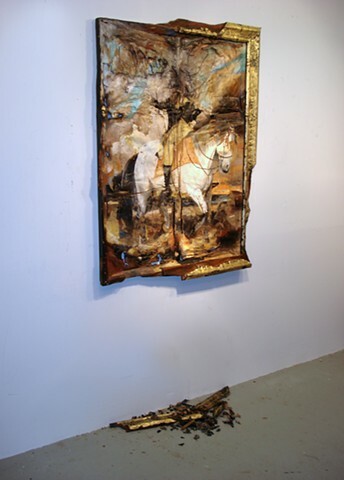 I wanted the painting to look damaged in some way, whether by fire or decay, altering George Washington and his horse to appear like a resurrected cadaver (like a zombie) that has been unearthed and roaming the post-apocalyptic American landscape. George Washington's head is missing through the imagined crisis that damaged the painting, recalling the story of the Headless Horseman. (which in the American version of The Legend of Sleepy Hollow, was a Hessian soldier whose head was decapitated by a stray cannonball during the Revolutionary War). Also I tried to create an effect where the stretcher bars are being exposed through the painting to emphasize the idea of skeletons--of the painting and of the bodies of George Washington and his horse. The exposed stretcher bars also hint at a carousel horse or scarecrow. This political and social commentary seemed especially of interest as the work was finished post-election, high-lighting (to me at least) the idea of the hauntings of the past coming back to visit waking life.